Among all ICOs that you can find at our website, in our humble opinion, Solana is one of the ICOs that already have the biggest success in the field of blockchain problems that are trying to be solved, and in the future will be even more successful. While talking about Solana as a successful ICO, it primarily refers to testnet versions of ICO solutions that already reached the higher goals in this field! Just wait to see what goals Solana ICO already accomplished, you will be amused! Solana ICO is an upcoming ICO, founded in 2017, San Francisco. Solana ICO is a new architecture for a high-performance blockchain, with a pretty much complex whitepaper, as you could actually assume from the ‘high-performance blockchain’ phrase (it is complex for someone who does not understand programming codes). If you don’t, whitepaper might be really hard to read! Solana ICO’s whitepaper has 32 whitepaper pages with the list of references at the end if you wish to make a further research on this ICO after reading our Solana review. As we always try to make it simple, easy to read, objective and a little bit fun, we will follow the same principle in this particular review, as well. Solana ICO, for now, did not set the fundraising goal but we will know more about it very soon, so make sure you come back to this article in a while to check if there are any new updates. Our recommendation is to visit us once a weak to make sure you are familiar with any ICO updates, or to make it easier and save your time and worry whether you have all relevant information, you can subscribe to our newsletter (with only the most useful and important information). One of the main problems of blockchain is the scaling problem. The scaling problem is most visible when it comes to solutions that are decentralizing blockchain. What is more, maintaining quick finality while the network scales is a major problem and many current solutions compromise decentralization. (Solana has a solution for this particular problem, so just keep reading, it is about to become very interesting.) In simpler words, finality refers to preventing the reverse process of completed transactions (once completed transaction cannot be uncompleted / removed), so the finality is one of the key elements of which blockchain is designed. The key blockchain problem today is the scalability problem of blockchain networks, and can be solved with innovative solutions with forks, or in other words – with a solution that would increase the limit of transaction that blockchain network can process. When the blockchain network increases, that limit should rise. There are not one, but many problems with blockchain scaling today, that are the result of insufficient block limit, like transaction times and the fee sized that are increasing (both, the time and fees). There are a few attempts to solve this (major) problem, but for now, none of them succeeded. Our experience with blockchain showed us that for every problem there is someone who will bring the right solution; it is only the matter of a right combination of knowledge, idea and the team that is developing the solution. Second, that kind of solutions pretty much always comes when expected. This blockchain problem must be solved, and it will be, it is just the matter of time when some of the current developers who work on forks will bring the best solution. Let’s see if Solana ICO has the best combination of elements needed to solve this massive problem (if so, it will truly be the most successful ICO ever!). This solution is made in a way to allow the transactions to flow through the network independent of consensus, plus, they are limited only by hardware. There are three main elements of which the Solana solution is made of: proof of history, performant system architecture, and the fast proof of replication. Proof of history is time encoded as data allows for simple and efficient proofs and protocols; performant system architecture enables network for maximum throughput and high availability. The smart contracts are very important here, because Solana made a change in that aspect of blockchain technology, as well. Smart contracts are designed for fast execution, and finally, fast proof of replication is designed for storing a largely distributed ledger. First, let’s see more about Proof of History. Proof of History can be explained as the combination of time source and blockchain. If you read more carefully how Solana ICO is presenting their solutions, you will notice they compare this PoH ‘solution’ with Google’s TrueTime, in order to make solution presentation to the public more understandable. The point of Solana’s Proof of History is that it can verify the time and order of events without witnessing them directly, and in that way, all processes are much faster and simpler. Next picture will show you how it influences other solutions, like the number of transactions per second. Therefore, the new Proof of History influences the scaling process, in a way that Solana does not need the sharding. The vision of Solana advisors is to take blockchain problems and solve the problem causes, instead of filling the blockchain architecture/algorithms with unnecessary solutions that only serve as a temporary solution. That’s why this ICO didn’t implement the sharding, but completely avoided such process. As Solana is the upcoming ICO, and the finality times will reduce as the network grows, all the pictures above are demonstrative, and they do not represent current data and information. However, Solana expects about 500ms finality, up 10s of thousands of nodes (the picture above). Solana has not only the PoH that will help ICOs goals, but also PoRep (which stands for the Proof of Replication), and those two combined gives significant forgery defense of the ledger with respect to time and storage. These two solutions will enable 710 thousand transactions per second (with existing hardware). Now, look at the next picture. Again, remember that this illustration is only the assumption of how the use (production) of Solana’s smart contracts will rise in the following 10 years (from the year 2018 to 2028). This picture is all about the scalable smart contracts. Solana recognizes the problem of smart contracts development. Solana saw that the solution is in the scalable smart contracts that can be written in any language. As you can see at the picture above, this ICO is counting on doubling GPU cores (smart contracts engine runs on the GPU), which means that a 5 thousand dollar machine today, will be able to execute 14,00 smart contracts, and in two years 28,000 smart contracts. At Solana web page you can see they are claiming that ‘’in 10 years, Solana will be the first blockchain to process a billion transactions per second’’, but better think of it as a ‘might be’, instead of ‘’will be’’. It is very risky to claim that ICO solution will be widely accepted and that they will be the first and the biggest blockchain network that processes a billion transactions per second. To be honest with you, it is never wise to simply run into investment because there is such an optimistic view of the future development of an ICO (not only for this one but also in general), especially if said by themselves. Rather read our review to the end to see our conclusion about this ICO. Let’s just say that no matter the fact that you perceived this ICO as quality and promising, take your time and devote yourself to deeper ICO research. It’s not that we tend to undeceive you from this ICO (to be honest, there is no reason for that because it really is a promising ICO), but to help you make wiser investment decisions. 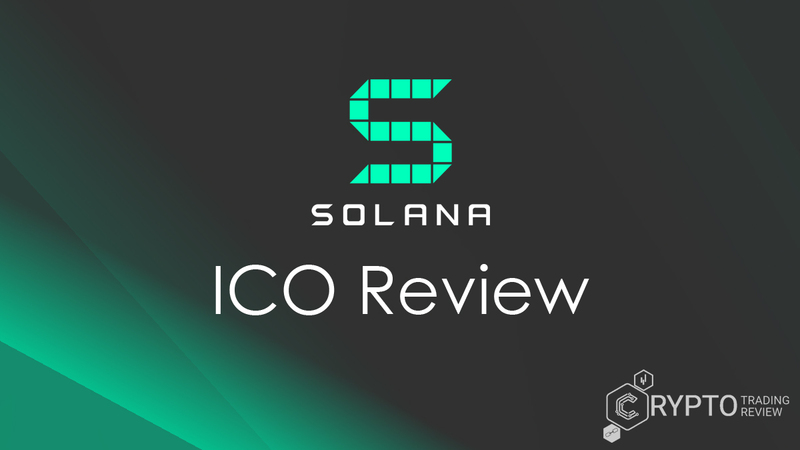 This review should give you some of the most interesting information about this ICO – sale process information for Solana ICO – BUT unfortunately, that information is not announced for now. Still, read why is that so, and why you should OR should not consider investing in Solana ICO! As we are talking about upcoming ICO that is focusing primarily on the blockchain technology development, there are some things that they, for now, delays for some further months (read more about it in the section about Solana roadmap), like the whitelist, pricing, bonus, and other information. In other words, we will need to make a conclusion about Solana ICO based on their whitepaper (written for those who does understand the blockchain technology), not the token and other information. Token sale starts from January to March, but for now, unfortunately, there are no exact dates. Some of you have (very logical) habit to send the email or any other message form to the ICO in which you are interested in order to ask them about token sale dates, pre-sale, questions about roadmap etc. Do not do that with this ICO. Well, truth to be told, nothing bad would happen but if you do your research at Solana official webpage, and press ‘presale’ button, you will get the answer that they don’t know, cannot give you, and will not answer you any questions about presale date, minimum/maximum information etc. Why is that so? Are they perhaps rude, unprofessional, without understanding the importance of good relations with the potential investors? Well, the answer is no. Currently, Solana is focusing on building the technology (which we will present in our Solana review), and for that reason do not have time for reaching everyone who submits question form to them with all the questions, and which, btw, only delays their progress on the tech! These are their exact words. If you ask us, this kind of business approach first reminds us of some of biggest world entrepreneurship who has only one type of shirt/jeans because they are focusing on their business, without spreading energy in something that is currently not important. However, why are we writing all of this down? Why is it important? Well, as technology developers, Solana team and advisors have great hype in the media thanks to the quality of their team and advisors, and finally, the product. Even more important, Solana has a great product and a whole bunch of expert developers who are working day and night focusing on the quality and functioning of product delivery! We will excuse them for low team and advisors activity with the public. Hope you will do the same. First of all, let us inform you that at any time you can become Solana team member! Of course, you must fill their needs and requirements (is it even necessary to highlight that?). The interesting thing is that this ICO points out career section on their official website, which, to be honest, very few ICOs does. Solana has an open career forms on Solana’s official website, so you can apply for participating in ICOs solution development, of course, if you have appropriate knowledge and experience when it comes to job positions like Engineering, VP of Engineering, Engineering Principal, and Senior Engineer. You can apply for those jobs at any time! The thing is that you can participate in Solana ICO solutions with your knowledge now or in any future time. Isn’t it great? From a view of a potential investor, it’s great to know that quality of ICOs blockchain solutions does not depend of currently known (popular) names in this industry, but anyone with this kind of experience can contribute to ICOs success and solution quality. In other words, the chances for Solana’s success has just raised! Let’s now see the main team and advisor members! None of them is highly popular and recognized in a way of Nakamoto’s popularity, but their experience speaks for themselves! We all agree that the ICO who’s solution for this problem will be widely accepted will be the biggest blockchain innovation and revolution to a blockchain ever! In terms of investing in such ICO, no matter the risks, it would be wise to purchase some tokens no matter the token price. But, let’s not rush with that (nor is Solana rushing with the token sale). If you feel we just gave you enough information about team quality, and you are not interested in reading short demonstration of team members’ experience, just skip the following paragraph and go to the hype in the media section! Anatoly Yakovenko as a CEO has 2 patents for high performance Operating Systems protocols, was a core developer for BREW that powered every CDMA flip phone (100m+ devices) etc. Greg Fitzgerald is the principal architect of Solana ICO, and as well as Anatoly, he worked at the BREW OS and published many open source projects, like the license analysis tooling in Python. The guy who does finance, product and operations in Solana has 10 years’ experience in product management and finance, and the one who deals with data science and token economics for Solana has Ph.D. in particle physics and after the postdoc in Medical Physics led data science at Omada Health. Don’t say it is not relevant for Solana ICO! Eric Williams is one of the best persons for data science for an ICO! Other team members are Stephen Akridge (Engineering), with 10 years of experience with critical GPU optimization at Intel and others), Alan Yu (is responsible for partnerships) with 10 years experience at Google in sales in marketing, plus the blockchain experience, Michael Vines (Principal Engineer) with 14 years experience at Qualcomm as Senior Director, Rob Walker (Principal Engineer, as well) has 17 years of experience in Qualcomm leading teams spanning BREW, Component Services, DASH, and Snapdragon, and finally, Pankaj Garg (Senior Staff Engineer) who worked 10 years in the Innovation Center. Solana has 33.049 members at Telegram (and is actively inviting visitors from the official webpage to join the Telegram Solana community). It has 257 subscribers on YouTube channel with a total of 10 videos from the public presentations of Solana ICO technology blockchain solution, or in other words, they are all talking about their particular approach to scalability, but with a very low number of people who viewed their videos. YouTube video with the most views has 859 views, and the less popular video has only 32 views. This might prove two things. We personally prefer to hear the negative thing first, so let’s do it that way. Solana is highly popular ICO in this field but even though, it has average, even low, YouTube popularity. Not the positive/good one, that is not due to Solana’s lack of YouTube activity but due to the fact that all technology solution is described in the ICOs whitepaper, so there is no need to promote YouTube videos. Or is it? Let’s see how Solana stands with other social networks. There is low activity on Github, 81 followers at LinkedIn, and 5,136 followers on Twitter! If we look at the type of ICO, we must highlight that it is actually great hype in the media. The focus is still on the product, and when it comes to social network connections with the public, Solana has very high hype at two very important networks for this type of ICO. As stated earlier, Solana was founded in 2017. In November 2017 Solana published the whitepaper, and in February 2018 tested single node, while in the June 2018 tested multinode. These roadmap phases went on time and as planned. At this moment Solana team works at the public testing. If that process will go as planned we can expect smart contracts (SDK) in September this year, and the live mainnet in Q4 2018. In Q1 2019 token distribution is planned. What can be concluded from this roadmap is that Solana ICO plans development phases and steps very wise. But, that is expected from this kind of ICO. ICO’s that have very simple product requires much less time to deliver the final product and much earlier starts with the token sale. Let us give you small tip. It is always wise to look for ICOs with long period development roadmaps, instead of looking for less serious ICOs that are launching the product month after ICO foundation. First ones are more serious and we can usually expect much more of them! Let’s see is the Solana team really capable of ending this project with great blockchain solution. Solana already reached 700% increase in transactions per second comparing to the previous Solana version that had 35,000 transactions (latest version had 250,000 transactions per second / txn/s). The picture above shows us that Solana’s analysis of the solution and industry assumes 710,000 transactions per second. No matter if Solana reaches that goal or not, it already has the best blockchain solution for this blockchain problem. As stated in the Solana roadmap section, the token distribution will be known in Q1 2019 when the token sale will start (January-March 2019). Token sale goal is not set for now, as well. Solana ICO team and advisors highlight that all information given on their website is only a prediction of how their solution might act in the future. Still, a lot of information at their website is not only a prediction, because all of them are based on detailed analysis of blockchain industry. If you look at their whitepaper and other available information about their solution, and on the other hand, if you look at the scaling blockchain problem, you can see that their predictions (based on expert analysis) are actually realistic. Why are we talking about this in the token use and distribution review section? Well, some of the biggest blockchain solutions (ICOs), by the time when they were in an ICO phase of blockchain solution development, were presented as a current ICO (with open token sale) and it was a fraud, so don’t fall into this trap if you see that Solana ICO just started the token sale! (It might happen because they will most probably reach success as shown in pictures in this review!) We will publish token sale, use of tokens and token distribution information for you, so make sure to come back to our Solana ICO review at least once a week to check if there are any ICO updates. First, you can see that Solana is one of the most serious, professional, and promising ICOs that we (all) have seen in the last few months, or even years. Their intention is not to collect assets and then deliver any product/solution no matter the quality nor the practical use. It is the opposite, and that is the main reason why this ICO gained our full trust. While talking about their professionalism combined with Solana project intentions, you can see that while they talk about the token sale, they speak as ‘when and IF Solana offers tokens for sale at all’, depending on things in blockchain industry that are out of Solana’s control. As you could see previously, Solana has the best combination of team member experience, so if asking us, there is no doubt about this project success (and token sale). If you explore them more detailed, you will realize that these claims from ICO are not just self-protective (of any changes in token offer in case something goes in the wrong way) but you will see that the claims are written and meant in the most professional way and with an intention of securing the trustful and transparent relations with potential investors. We cannot comment anything about token sale right now (lack of information) but if you look at other review sections written above, you will see that team experience and hype in the media, as well as the problem solution and the plan of product and ICO development (this one refers to roadmap), is great. The combination of these ICO elements while considering Solana are truly great and promising! Well, promising might even be the wrong/inappropriate word for this ICO. They actually do not promise anything (nor will we, and actually never do) but focuses on the solution development. Finally, any ICO cannot give the solution for the blockchain scaling problem if the solution is not sustainable and developed by a team of highly experienced developers. Solana definitely has them!